When governments around the world sell the rights to exploit minerals, timber, oil, and gas, they enter into long-term contracts with the companies buying these resources. In the past, these contracts have typically been kept secret. ELAW partners around the world are playing a big role in changing that practice. Through their efforts, the veil of secrecy surrounding natural resource contracts is being lifted and citizens are finally gaining the opportunity to understand how their resources are being managed, and at what cost. 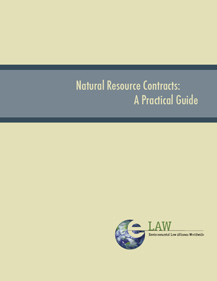 ELAW is thrilled to be releasing a new publication, "Natural Resource Contracts: A Practical Guide," which will help grassroots advocates around the world understand these agreements and advocate for stronger environmental, social, and fiscal provisions. ELAW Staff Attorney, Liz Mitchell, wrote the guide. She observes: "As more governments respond to calls for transparency and release natural resource contracts to the public, ELAW saw the need for a plain language guide that helps demystify these complex agreements. This guide compiles lessons we've learned from reviewing dozens of natural resource contracts over the past decade." The guide is available on ELAW's website. Many thanks to the Philip Stoddard and Adele Smith Brown Foundation for making this much-needed publication possible.